Most 2nd Mondays of the month from 4:30 to 6 pm at St. Mary’s Episcopal Church, 1300 Pearl Street, (SW corner of 13th & Pearl). Check the weekly calendar for confirmation. No support groups or social skills activities in August. 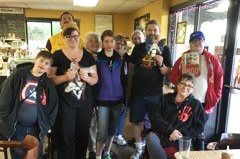 A standing tradition in Eugene, this group is for high-functioning adults (18 to much older than that) on the Autism/Asperger’s spectrum. This is a safe place to share with others on the spectrum about things from living on your own to jobs to getting along with folks and so much more. Group members choose the topics, and there are from 12-20 participants each month. Michael is an experienced facilitator who is also a parent of an adult on the spectrum and an active member of the KindTree/Autism Rocks community.